Journalism and public media are broken. And sometimes, to fix what’s broken, you have to start something new. That’s the premise behind ZigZag, a new podcast from producers Manoush Zomorodi and Jen Poyant. The two women left their jobs at WNYC to start their own media company, Stable Genius Productions, and ZigZag is their first show. They’ve got a lot of people in their corner: the podcast is part of the Radiotopia network and is being backed by Civil, a blockchain-based “marketplace for sustainable journalism” (more on that later). While at WNYC, Zomorodi and Poyant produced a show called Note To Self — formerly New Tech City — where they tackled topics like data security, internet addiction, and the influx of fake Twitter accounts. Zomorodi herself is probably best known for her Bored and Brilliant series and book, where she argues that boredom is critical to both creativity and happiness. Although WNYC has yet to make clear the future of Note To Self, Zomorodi addresses her reasons for leaving the station in ZigZag’s first episode. She and Poyant wanted greater creative freedom and ownership of their work, and they were unhappy about the station’s slew of sexual harassment allegations. Fueled by a combination of #MeToo momentum, fast-moving innovations on the blockchain, and a climate of distrust for media, Zomorodi and Poyant have set out to “change the course” on journalism, capitalism, and women in tech. ZigZag will likely be compared to StartUp, which in its first season told the real-time story of how Alex Blumberg and Matt Lieber started Gimlet Media. And in fact, on ZigZag’s fifth episode, Zomorodi and Poyant sit down with Blumberg and Lieber to discuss the similarities and differences of their shows. 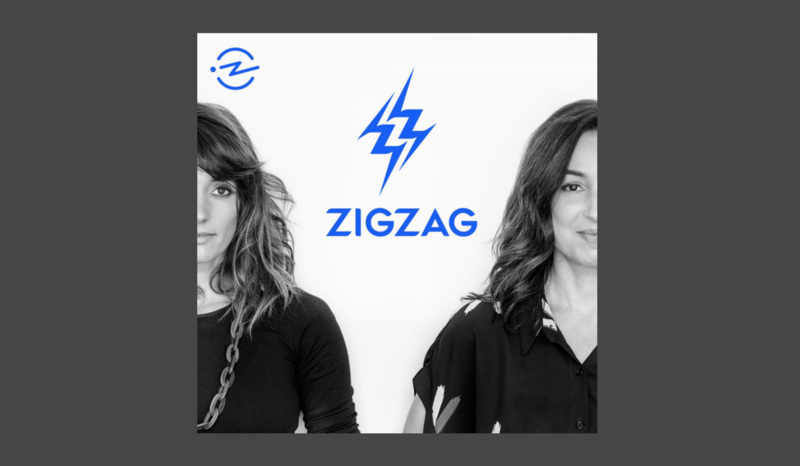 But as PodMail writer Caroline Crampton recently wrote, ZigZag is certainly much more than “the female version of StartUp.” Because while the shows have undeniable similarities, there are also undeniable differences in the experiences of male and female entrepreneurs. Such as the fact, discussed on the episode, that female founders received only 2.2% of all venture capital funding in 2017. ZigZag’s exploration of these contrasting realities gives rise to conversations about entrepreneurship, vulnerability, and the startup scene — and manages to examine gender and diversity without using it as an excuse or an attack. From a production standpoint, ZigZag is incredibly well-structured, bearing influences from across the radio dial. On the show’s second episode, “Blockchain. Block what! ?,” the musician Martin Austwick is enlisted to explain blockchain though song — a tactic frequently employed by Radiolab; the recorded conversations and outtakes are similar to the end credits of NPR’s Invisibilia; and there’s a friendly, explaining-the-thing tone that feels reminiscent of the The Daily and The Atlantic’s Crazy/Genius. It’s clear that Zomorodi and Poyant are good at their jobs: they know how to make a podcast. But from a story perspective, the show can be a little confusing. ZigZag positions itself as a personal narrative about the journey of two female founders. But they’re also part of and partly funded by Civil, a “decentralized marketplace” to “help power sustainable journalism”. It’s hard to understand, even if you consider yourself a tech-savvy person. I’ve read the lengthy Civil Constitution and have dabbled in cryptocurrency a little myself — I have $42.81 in Litecoin — but I definitely don’t understand the company’s business model. Luckily, I’m not the only one who finds it complicated. On episode seven, “A New Frontier for Journalism?,” Zomorodi and Poyant walk through the announcement that CVL tokens, Civil’s own cryptocurrency, are available for purchase. To buy a token, you must first pass a quiz about the basics of Civil. And Zomorodi, our fearless blockchain guide, fails the quiz. The two go on to read questions and concerns that listeners have about Civil‘s model, and then propose a recurring feature in the show to answer them. That’s useful, but it raises the question: Is this a show about two female entrepreneurs trying to save journalism, or an explainer-podcast for a new and slightly bizarre cryptocurrency? Despite this confusion, perhaps because of it, the show works well. Zomorodi and Poyant are venturing into uncertain territory and trying to figure out a business model they’re not sure will work. It’s this honest approach — where they don’t pretend to understand everything that lies ahead — that makes their story so authentic and enjoyable. They’re taking a big chance on a new idea, and giving us a truly behind-the-scenes look along the way. Next PostThe Wilderness: What’s Next for the Democratic Party?